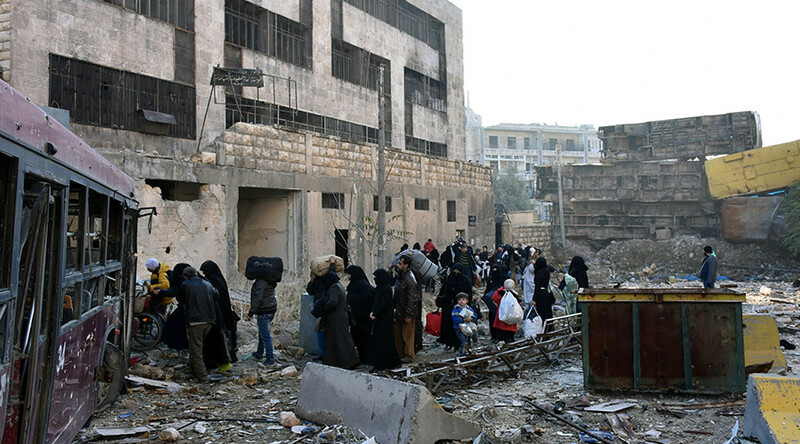 Some 8,400 civilians have been evacuated from the militant-held districts of eastern Aleppo over the past 24 hours, Russia’s Defense Ministry said in a statement, adding that military specialists continue to sweep mines and explosives in war-ravaged areas. A temporary suspension of Syrian Army military operations in Aleppo over the last 24-hour period has allowed for the organized evacuation of some 8,461 civilians, including 2,934 children, from areas of East Aleppo that remain under militant control, the Russian Center for Reconciliation said in a statement. In the meantime, the center added, Russian sappers continue mine and IED removal activities in the districts, completely clearing an area of some 60,000 square meters. Military specialists have also demined and restored Aleppo’s central water pumping station to a functional condition, as well as two power plants, two schools and two mosques. At least 14 militants have laid down their arms and surrendered to the Syrian Army, receiving amnesty in accordance with Syrian President Bashar Assad’s decree. On Thursday, Russian Foreign Minister Sergey Lavrov announced that Syrian government forces suspended “active” combat actions against militants in eastern Aleppo to carry out a “tremendous” operation to evacuate thousands of civilians. “Combat operations by the Syrian Army in eastern Aleppo have been suspended because the largest operation of evacuation of civilians from East Aleppo is being carried out – a column of about 8,000 people, it's a tremendous operation,” Lavrov said.